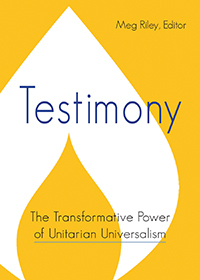 I should have been told about Unitarian Universalism the day I followed the rabbi into the back of the synagogue. Third grade Emily knew it was breaking a rule to spy on the bearded man, but her thirst for knowledge and innate skepticism overpowered her obedience. Curiosity killed the cat, they say, but I knew the second half of that refrain: …but satisfaction brought it back. Something had been fishy about his claim that the light above the Torah’s Ark was unending. How could a flame be eternal? This did not match with the science I knew, even as an eight-year-old. It turns out there was a hidden light switch for that symbolic light, and when I confronted the rabbi with “the jig is up!” glee, he soon suggested I learn Hebrew from a local Israeli family rather than learn prayers over rainbows and bread. Consequently, I learned a new language and began a path that would lead me to speak many more. However, I never forgot that eternal flame. My quest shifted from trying to prove the rabbi wrong to trying to find something everlasting. I had the first hint from my mother as she drove me back from music lessons in Queens. Back then, iPhones did not impede carpool conversations, and some of our best interactions were on those afternoon traffic commutes. Sometimes we would sing together; on the day I found this first clue to eternity, she taught me a round. Its first lyrics were short and deep: All things must perish from under the sky. At first, I was intrigued by a new vocabulary word: perish. How could such a sad word have such gentle sounds? Perish, cherish…it didn’t make sense! Then, I realized that the message matched my quest in the sanctuary. I listened more deeply to the next set of words: Music alone shall live, never to die. By then, I had grown a few months less literal. After my mother countered my objection to the blatant scientific lie (Music isn’t alive! Sounds fade!) with a reminder that language can be symbolic, I began to think about song-waves (sic) dancing out past the edges of the solar system, becoming more and more spread out but always moving further away until they reached some alien’s ear. I shared the idea with my big sister who promptly pointed out that not everything has to do with outer space. Even here on earth, Beethoven’s music will outlast all of us. The exact notes may fade, but the songs endure. Fast forward to 1993, and journey with me across the Atlantic to the amphitheater in Avignon’s Palace of the Popes. As a student at the theater festival, I was able to watch Molière’s Dom Juan in this magnificent venue. My friends and I sat underneath a starry sky, and I pondered how many other productions of this same show had been performed in this same spot, how many other actors had bowed here, and how many audiences had applauded here. So transfixed in thought was I that I did not notice the sky clouding over. Somewhere before the fifth act of this 300-year-old play, raindrops began to splatter on our programs and dance on our heads. The actors realized the show would not be able to continue through to its conclusion, and it was well past the halfway mark for possible rain-day refunds. In this fourteenth century palace, I saw an improvised fifth act of Molière’s old standard. I experienced the intersection of eternity and the ephemeral. Reverend Seth shared with us great scientific data about memory and DNA, epigenetic messages that transcend the generations. It is still a great mystery how traces from the past can affect us. I think about those mice of experimental fame who demonstrated reactions to scents that their grandparents had been conditioned to respond to. I think about my own predilection for a song that played in my great-grandmother’s music box, one that was silenced long before I was born. I think about how earnestly we share our love and concern for families and friends at the Milestones segment of services. Something endures. Something connects us through time. It may be genes or music or love or memories. It may be a symbolic flame of faith or the human need to solve mysteries. It may be traditions that we pass on at holiday time. Something endures. As we celebrate at this season of family and light, be in the moment as if it is a show that will only be performed once in all of eternity. At the same time, feel your connection to the distant past and the far-off future. Enjoy that sense of awe and mystery, and savor the light we all share with one another.